The January 26, 1919 issue of the Nashville Banner listed some of their favorites: the daisy, red clover, rose, water lily, elder bloom, goldenrod, wild rose, sunflower, and violet. The eventual winner, the passion flower, wasn't even mentioned! Although the passion flower was adopted as Tennessee's state flower in 1919, Tennessean's loyalty shifted. 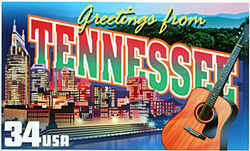 Nashville, Tennessee became known as the Iris City. Iris fans joined forces and campaigned for the adoption of the iris as the Tennessee State flower. In 1933, however, the Legislature adopted Senate Joint Resolution 53 designating the iris as the "State Flower of Tennessee," but failed to formally rescind the designation of the passion flower as the state flower. To eliminate this confusion, in 1973 the 88th General Assembly, by Chapter 16, designated the passion flower the state wildflower and the iris the state cultivated flower. The passion flower (genus Passiflora) received its name from early Christian missionaries to South America, who saw in the flower's various parts symbols of the crucifixion of Jesus Christ. 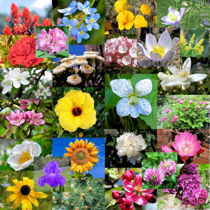 Wild passionflower, maypop, apricot vine, old field apricot, Holy-Trinity flower, mayapple, molly-pop, passion vine, pop-apple, granadilla, maycock, maracoc, maracock, white sarsaparilla. 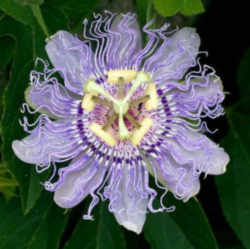 The passion flower, genus Passiflora, which grows wild in the southern part of the United States and in South America, is also commonly known as the maypop, the wild apricot and the ocoee. 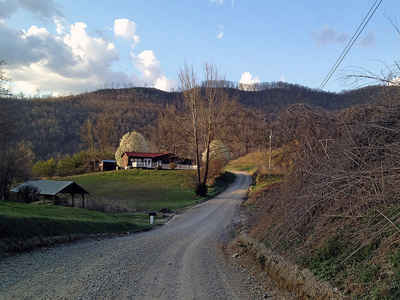 The last is the Indian name that has also been applied to the Ocoee River and valley. The Indians prized the ocoee as the most abundant and beautiful of all their flowers. The passion flower received its name from the early Christian missionaries to South America, who saw in the various parts of the curiously constructed flower symbols of the Crucifixion- the three crosses, the crown of thorns, nails and cords. Passion Flower was first discovered in Peru by a Spanish doctor named Monardes in 1569 who documented the indigenous uses and took it back to the Old World where it quickly became a favorite herb tea. Spanish conquerors of Mexico and South America also learned its use from the Aztec Indians and it eventually became widely cultivated in Europe. 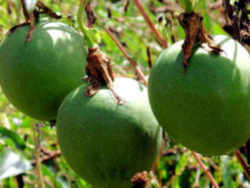 Since its discovery, Maracuja has been widely used as a sedative, antispasmodic and nerve tonic. Indians throughout the Amazon use the leaf tea as a sedative. When introduced into Europe in the 1500's it was used as a calming and sedative tea. It was introduced in North American medicine in the mid 1800's as a sedative through native and slave use in the South as a tea, as well as bruising the leaves for headache, bruises and pain. In many countries in Europe and in the US and Canada, the use of Passion Flower to tranquilize and settle edgy nerves has been documented for over 200 years. Its long documented history in herbal medicine has included its uses for colic, diarrhea, dysentery, dysmenorrhea, epilepsy, eruptions, insomnia, morphinism, neuralgia, neurosis, opthalmia, piles and spasm. 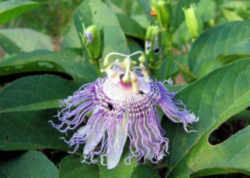 Passion Flower is widely employed by herbalists and natural health practitioners around the world today. It is mostly employed as a sedative, hypnotic (inducing sleep), nervine, anti-spasmodic and pain reliever. In the United States, P. incarnata is the species most used to treat insomnia, Parkinson's Disease, seizures and convulsions, muscle cramps, hysteria, high blood pressure, tetanus, shingles, neuralgia, dysmenorrhea, menstrual cramps and PMS, epilepsy, and as a pain reliever in various conditions. In Europe, it is employed for nervous disorders, insomnia, spasms, neuralgia, alcoholism, hyperactivity in children, rapid heart beat, headaches, and as a pain reliever and antispasmodic. In South America, P. edulis is the species most used as a sedative, diuretic, antispasmodic, and anthelmintic (expelling intestinal worms) which is used to treat convulsions, paralysis, alcoholism, headaches, insomnia, colic in infants, diarrhea, gripe, hysteria, neuralgia, menopausal symptoms and hypertension. In both South and North America as well as in Europe, Maracuja is used topically for skin disorders, inflammation, hemorrhoids, and burns; having an anti-inflammatory and pain-relieving effects. Passion Flower has been the subject of much scientific research. After almost 100 years of study the sedative, antispasmodic and analgesic effects of Maracuja have been firmly established in science yet these effects have not been correlated to any one chemical or group of chemicals found in the plant. Passion flower contains two major groups of chemicals - glycosides and flavonoids as well as alkaloids. When these chemicals are isolated and tested individually they have demonstrated the opposite reactions for which the plant is commonly used for and only when the two are combined as a whole herb, do researchers observe the plant's sedative effect. The analgesic effects of Passion Flower were first clinically documented in 1897 while the sedative effects were first recorded in 1904. Antispasmodic, anxiolytic and hypertensive actions were clinically validated in the early 1980's. Passion Flower is classified as "Generally Regarded as Safe" by the FDA, is the subject of various European monographs for medicinal plants and is generally regarded as safe even for children and infants. Herbalists usually recommend six grams of the herb daily in an infusion (tea). The law designating the passionflower as the official Tennessee state wildflower is found in the Tennessee Code, Title 4, Chapter 1, Part 3, Section 4-1-306.